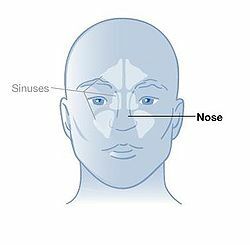 The Nose is an organ of the olfactory system. It is an amazing creation of God that allows creatures to smell things, and also is a factor in tastes too. There are so many intricate parts that are vital to making the nose work. 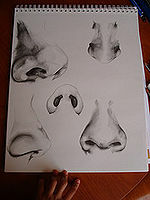 Everyone has different noses, as they come in all shapes and sizes. Some are more powerful than others, which is especially prevalent with animals. Humans have two olfactory bulbs in their nose. These are protected by cribriform plates. These plates have tiny holes in them to allow axons of olfactory neurons to synapse with neurons in the olfactory bulb. These holes are called olfactory foramina. The olfactory neurons also have olfactory hairs and olfactory vesicles attached to the other end of them. These hairs are surrounded by a layer of mucous, which catches the particles floating around, allowing us to smell them. If a chemical is not volatile, it cannot be smelled. Volatile means a substance that is airborne. A dog has a very keen sense of smell. A dog's brain contains a large section devoted solely to smell. This section is roughly 40 times more than that of a humans. This is due to the fact that dog's brains have two giant olfactory bulbs that identify every smell that enters the dog's nose. These bulbs are four times as large as that of a humans olfactory bulbs. 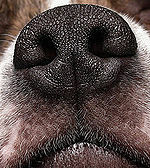 The dog's wet nose also catches tiny particles and dissolves them, detecting even the tiniest smells. The dog has a large range of smell. It has been known to smell things that are even 40 feet underground. One researcher even found a dog to have been able to smell an electrical current. A dog can even figure out where a human went by smelling his footprints, so long as they are not more than twenty minutes old. Some dogs can even smell sickness. Dogs can tell whether a person has any type of cancer. The dogs can also learn to warn people before they have a seizure. Many dogs are known to have alerted people up to five hours before they had a seizure! These dogs are truly amazing creatures that could not have just got this sense of smell by chance. This is the handiwork of a wonderful Creator. Out of all the animals in the animal kingdom, the bear is said to have the greatest sense of smell. Their sense of smell is said to be about seven times better than that of a bloodhound's. Although the portion of brain devoted to smell is not very large, they make up for it in two ways. First, the bear has large nostrils with a lot of mucus in it to help catch every little particle. Second, bears have an organ located in the top of their mouth, that is devoted specifically to smell, called the Jacobson's Organ. Grizzly bears are able to smell clams that are hidden under the sand, or fish that are underwater. Also, bears will mark their territory or leave a scent to allow other bears passing by to know that another bear is in that particular area already. This plays an important factor for bears who are looking to find a mate. The shark is also another animal with an amazing sense of smell. To help accomplish this, two-thirds of a shark's brain is devoted strictly to the sense of smell. One of the most notable things about them is their ability to smell a drop of blood from over a mile away! The shark's smell is also directional, meaning that smells from the left side of the shark enter the left cavity, and the right side through the right cavity, allowing the shark to determine where the smell is coming from. Most sharks' nostrils are located underneath the snout of the shark, with a few exceptions such as the Hammerhead shark, whose nostrils are located on the sides of its head, and the Nurse shark, who, instead of nostrils, has whiskers used for tasting and feeling. ↑ How Stuff Works. How Noses Work. How the sense of smell works. Web. November 17th, 2011). ↑ St. John Providence. How the Nose Works. How the Nose Works. Web. November 17th, 2011). ↑ Jenkins, Garry. Canine Senses. Canine Senses: How Dogs Smell. Web. May 19th, 2011). ↑ The American Bear Association. Bear's Senses Senses of the Black Bear. Web. October 28th, 2011). This page was last modified on 1 September 2014, at 20:39.